Commissioned by the municipality of Nijkerk Bureau B+B has created a master plan for the Doornsteeg area of Nijkerk. The task was to develop a distinctive neighborhood with its own strong identity while taking into account the current market conditions. The themes “child-and family-friendly” and “sustainable” are crucial to create a green residential area that maintains a high degree of social cohesion. The time for ideological blueprints with a defined final image is over. The real challenge in developing an urban area consists primarily in how to connect places, people and parties, and only secondarily in the development of real estate. Flexibility and the possibilities to compensate for gradual transformation are essential. The masterplan represents the character and qualities of the area in the current situation and in the future. It thus gives a picture of the qualities that are kept and a view towards the desired future image. The master plan does not establish the final image, but it provides a framework of the main green structure, public space and infrastructure. The design of the framework brings clearness and consistency to the area. The intermediate spaces give the option of flexible urban developments that will be done in consultation with current and future residents, developers and entrepreneurs. Together, these parties, build the neighborhood. It offers the opportunity for people to influence their own living environment. At the center of the plan is organic development. There are large ambitions for the location, which craves to be a pleasant green area. The development has a guideline to achieve a lower density than the average Vinex location. 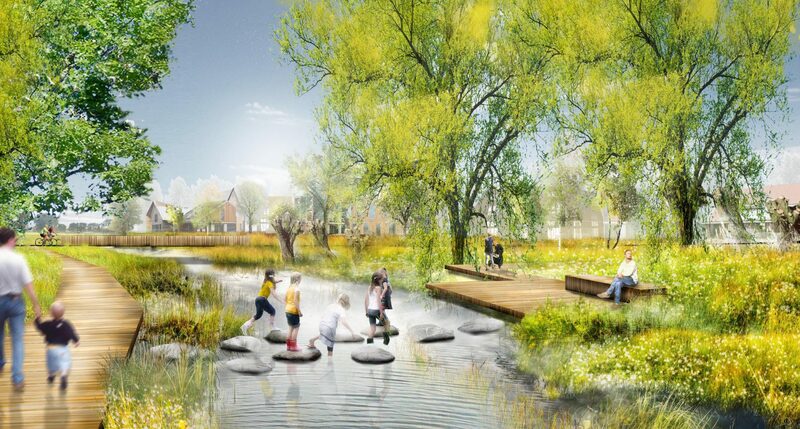 The relationship between the urban area and the landscape will be enhanced by connecting the adjacent landscape Arkemheen into the planning area. This green area is centrally located so many people already have a direct relationship with the area. This green area is called the ‘Stream Garden´ and functions as the heart of the district. It becomes the main structural supporting element of the design. The Stream Garden is based on one of the largest existing qualities of the planning area: the stream. In addition, the existing avenue of trees is preserved, and a green recreational trail flows through the neighborhood. The tree structure is enhanced and complemented by the existing ditches, which remain well conserved. The intermediate spaces can be developed separately, but may also be maintained in their current form. The main road access and close accessibility principles ensure that the new residents are not constantly living in a “construction site”.